The Pod Details page gives you a quick snapshot of any information you may need to know about the Pod attached to your pet. The information contained in the Pod Details section is available for quick reference via the Pod Details Button on the Pet Screen. Most users will only need this information from time to time, however, it’s important to keep handy. Firmware gives the version of firmware installed in your Pod. This is important to know and reference form time to time as there will occasionally be updates required. Some bugs may be unique to certain firmware versions so the support team may ask for this information. Battery tells the current battery life left in the Pod. 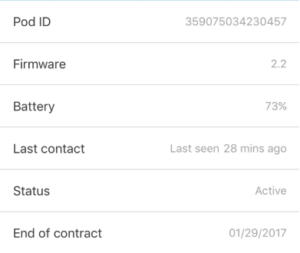 Last Contact tells you the last time your Pod made contact with your app. This will refresh anytime you do a location refresh manually or the Pod does an automatic location refresh (Safe Zone). 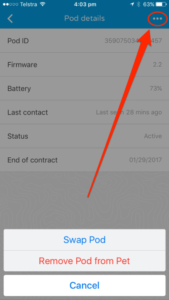 Status tells you if your Pod is Active, Renewed, Replaced or Inactive. This information will help the support team manage your subscription and account properly. 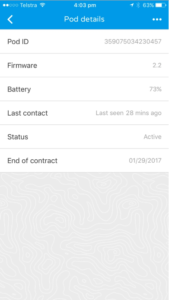 End of Contract tells you when your contract expires. You will need to renew your contract or subscription before this date in order to keep your Pod working. You will receive a series of emails leading up to this date to help you remember. If you ever need to change the Pod that is attached to your pet, this is where you’ll come to do so. When you click ‘Swap Pod’ on the menu accessed from the Pod Details page, you’ll see a list of available Pod IDs. Select the Pod ID you’d like to switch to. You can remove a Pod from your pet’s account by clicking on this button. In order to continue using your app you will need to add another Pod to your pet’s account. When you swap a Pod on your pet’s account, you won’t lose your pet’s adventures and activity monitoring data!